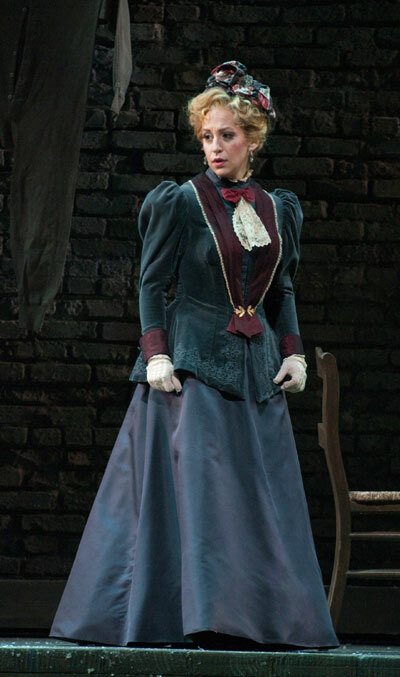 Soprano Jennifer Zetlan made her Seattle Opera debut in 2010, when she created the role of The Flier in Amelia. Now she returns to the company as Musetta in all three Sunday matinee performances of La Bohème, and will come back this summer as Woglinde and the Forest Bird in The Ring. 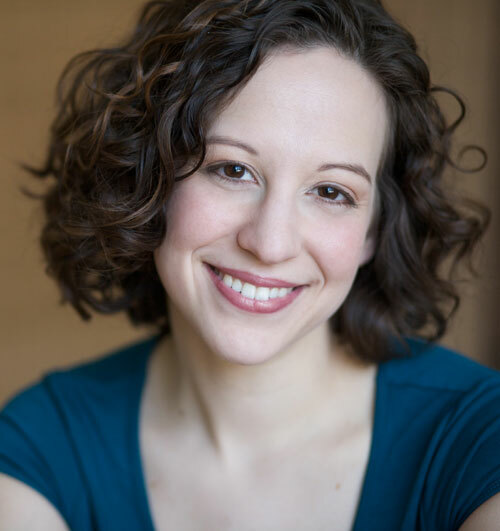 We sat down with her in between rehearsals for Bohème and asked about her experience with this opera, what type of roles she likes to perform, and what “swimming” rehearsals for The Ring entail. Welcome back to Seattle! Last time you were here, you were singing a brand new opera. This time, you’re singing of the classics of the art form. 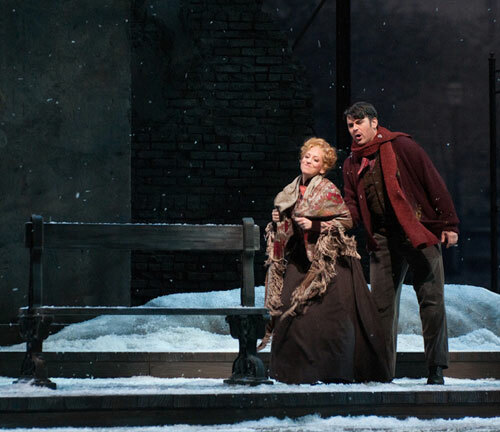 Why do you think La Bohème has endured the way it has? Bohème has a little bit of everything in it, so I think you can come to it at any moment in your life, at any mood, and take away something that applies to you. It’s universal, and people never get tired of it. 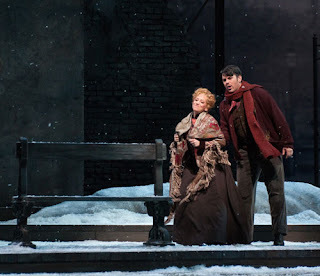 Jennifer Zetlan (Musetta) and Keith Phares (Marcello) in Seattle Opera's production of La Bohème. How do you relate to your character, Musetta? And, have you sung this role before? This is my second professional Musetta, and I also worked on it during my undergrad. Musetta, I think I understand her in my own way. I mean, I personally wouldn’t go to a café and break a plate and make a lot of crazy noise, but I think I understand where that comes from. I love her, because there’s something so deep and heartfelt about her, even though she puts on these airs—like how she behaves in the café. But she’s really hurting from her stormy relationship with Marcello, and you can see that in a few special moments in the opera. I love that. Jennifer Zetlan as Musetta in Seattle Opera's production of La Bohème. Well, that chord [when Rodolfo realizes Mimì is dead] really kills me every time, without fail. I could not see any of the opera but hear the chord and still probably weep. But my favorite moment to perform? I really love that Musetta comes to be this wonderfully caring friend in the fourth act, that suddenly she sends Marcello to sell her earrings, and then she goes and gets her muff, because she thinks this is Mimì’s last dying wish, to just have warm hands. And then when Mimì asks Rodolfo, “Did you give this to me?” he’s about to correct her and say, “No, it’s from Musetta,” and Musetta quickly says, “Yeah, he did.” And that’s it, that’s all she says, and then she walks away and lets them have their moment. I love that. I love to watch it, I love to perform it. La Bohème is a story about a great group of friends; have you been able to spend some time outside of rehearsals, socializing with this cast of performers? Actually, I have a fourteen-month-old daughter, so I’ve been hanging out with her! She’s here with me in Seattle. Oh, that’s great! So, is she an opera fan? I think right now she couldn’t care less about opera! [Laughs] But she does love to sing, and she has for a long time. She loves to warm up with me at the piano. Tell us, what did you last perform before coming to Seattle, and what’s next for you once you wrap up La Bohème? Juilliard has this Alice Tully Vocal Arts Recital Debut Award, which I won, so this past fall I did a recital in Alice Tully Hall in New York. And just before that, I was a bridesmaid in The Marriage of Figaro at the Met. The next thing I do is go to the Omaha Symphony for a concert, and then I do recital with guitarist Eliot Fisk and cellist Yehuda Hanani in Massachusetts. After that, I’m going to Nashville to do Pamina in The Magic Flute. It’s a jam-packed couple of months—and then I come back to Seattle, for The Ring! You were here recently for Rhine Daughter “swim practice,” weren’t you? [Laughs] I was. It was four days of training, and it was our second practice (we were also here last August for a week). It’s physical training and practicing being in the harnesses, so that we can get ready for the physical nature of these roles, which are pretty demanding. There’s also a lot of music and singing in the scenes we’re in, so the idea is to come early and get used to it now, so in the summer we’re not focused on the physical task, but can really focus on acting and singing. You’ll also return next season as Gilda in Rigoletto. But your career hasn’t really skewed toward standard repertoire, has it? I would say the majority of my work has been off the beaten path, which is why it’s so nice to come and do something like Bohème. It’s nice to do this very standard thing for just a while, because I do a lot of contemporary music. For example, last year in June—and also for two years prior to that—I was workshopping a new piece by Nico Muhly. Has your focus on contemporary works been by design, or just a happy coincindence? I’m not sure it has been by design, but I really do enjoy it. It’s just been a nice development in my career, I think, but I’m also happy to occasionally come back to Mozart and Puccini!